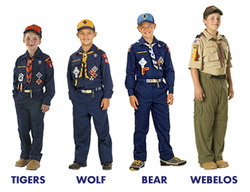 The Boy Scouts of America (and Cub Scouts) have always been a uniformed body. There are many reasons for this. One reason stands out above all the rest. We wear the uniform because it is a means of identifying ourselves openly with the principles to which we are committed—character development, citizenship training, and physical and mental fitness. Ravenswood Shopping Center off Braddock Rd. Uniforms and other items can also be purchased on-line from the Boy Scouts of America at http://www.scoutstuff.org/. On occasion, when an activity involves boys getting especially dirty, boys may wear a "Class B" uniform, a Pack 1530 T-shirt, available from the Pack. T-shirts will be given to all new boys joining the Pack. Adults are also encouraged to wear the Pack T-shirt, which may be purchased for $10 each from the Pack.